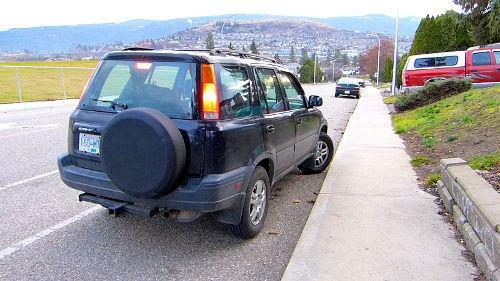 Hill parking is a required skill for a road test - remember the 3 & 1 rule. Watch the video! 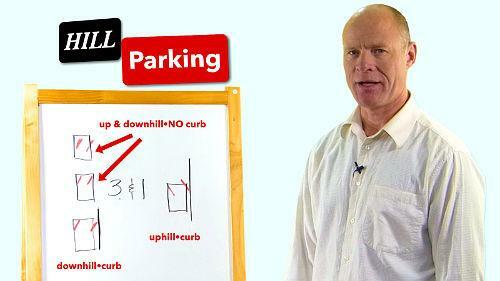 Hi there smart drivers, Rick with Smart Drive Test talking today about hill parking for the purposes of a road test. And this isn't just for passenger vehicles! In some recent work in Kamloops British Columbia, Canada--as some of you may or may not know-- Kamloops is built on a giant hill and people taking their license for tractor-trailer unit also had to demonstrate to the examiner that they could, in fact, hill park. So this could be applicable to all classes of license. Now when you hill park for the purposes of a road test, remember the "three & one rule": three of the hill parks are in towards the shoulder of the road - downhill with a curb; downhill without a curb; and uphill without a curb, are all in towards the shoulder of the road. The only time that you have the wheels out towards the center of the road is uphill with a curb. And if you have a curb, you're using the curb to secure the vehicle against movement. And so when you have a curb--downhill with the curb-- you resting the tires against the curb. So you're putting them in towards the curb and when your uphill with a curb you're gonna let the vehicle roll back and let the back of the steer tire rest against the curb to secure it against movement. When your uphill downhill without a curb you're simply pointing the wheels in towards the shoulder of the road, so the vehicle rolls off the road, as opposed to out into traffic. So today we're gonna give you a bit more detail about that. Stick around, we'll be right back with that information. 4) downhill with a curb. 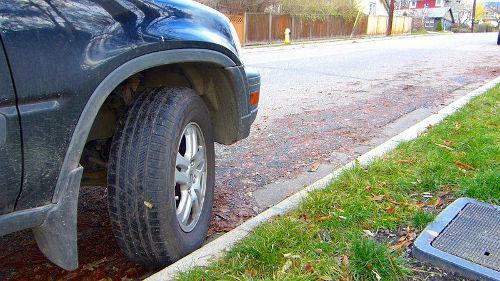 When you use the curb - you use that to secure the vehicle because you rest the steer tire against the curb, when you have a curb in the unlikely event that the brakes do release the vehicle is not going to move. My driving instructor gave me a great tip about this to help me remember: if I’m on a curbed hill facing up, be like super man and go up up and away! If you don't have a curb, you put the steer tires in towards the shoulder of the road. That way, if the brakes do release the vehicle is going to roll off the shoulder of the road and not out into traffic. three times you put the steer tires in towards the shoulder of the road. In towards the shoulder of the road downhill with a curb; uphill without a curb; and downhill without a curb, are all the times you put it into the shoulder of the road. The only time that you put them out is uphill with a curb. You put the steer tires all the way to the left, put the vehicle into neutral and allow it to roll backwards, and you rest the back of the steer tires against the curb. Just one note on hill parking. 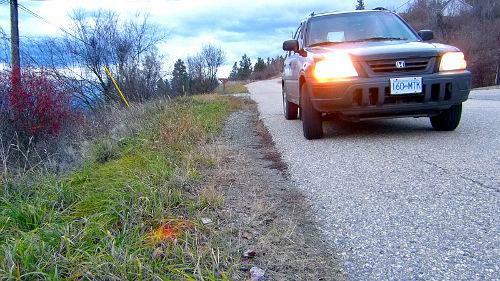 As you can see here in the image, we have these little half rolling curbs, and we have a lot of these in Vernon, British Columbia, Canada, and I confirmed with the driving examiner that, in fact, this is not a curb. And the question the driving examiner asked me was: "will it hold the vehicle?" And in this case, certainly that little curb will not hold the vehicle. So when you have one of these little half rolling curbs, turn your wheels into the shoulder of the road. Don't Fail Your Road Test!! A course for new drivers working towards their first license. teaches you winter driving, trailering, and how to stay crash-free after you get your license. And if you're not sure, call up your local driving school, or go down to the licensing center where you're going to take your exam and ask them to confirm that information. Again, as the driving examiner said to me, it's only a half point; it's a very minor deduction if you turn your wheels the wrong way on a hill park. So don't get too stressed about it. 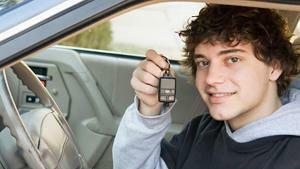 But again, check with your local driving school or the licensing center where you're going to be take your test. So what we're going to do, we're going to go out to the vehicle here and we're going to show you how to do this and give you a bit more detail. Parking Uphill With a Curb :: "Up, up & Away!" Locate the parking space you're going to park into - is it legal? Mirror, signal, shoulder check. Pull over six to nine inches (15-20cm) from the curb. Slow right down - as you're just about to come to a stop, crank the steering wheel all the way to the left. Control the brake - you will not need to give the vehicle any throttle at this point. And allow the vehicle to roll back. Just controlling the brake until the front tire touches the curb. When the front tire touches the curb, apply the brake - hold the brake. Apply the parking brake. If you're driving a manual, into a forward gear - first gear. If you're driving an automatic, put it into PARK. Hold the brake and turn the vehicle off. The vehicle is secure. If you leave the vehicle - you won't leave the vehicle for the purposes of a license obviously. But when you leave the vehicle, make sure you lock the doors and secure the vehicle - you know, hide all your valuables and those types of things. So that's how you do it for uphill parking with the curb. Preparing to go. We're getting the vehicle ready to go. So we start the vehicle, put your foot on the brake pedal, and release the parking brake. Put the vehicle into your forward gear - into DRIVE if you're driving an automatic. Mirror, signal, shoulder check. Your wheels are already cranked to the left because we're parked uphill with a curb. So the wheels are all the way to left so just note that when you start to take off that you can have to bring the wheels back to the right. Mirror, signal, shoulder check, there's a vehicle coming. Shoulder check again, and we proceed and again you have to be quick to bring the wheels back to the right because they're already cranked all the way to the left. So one-and-a-half revolutions on the steering wheel back to right. We look up into our intended path of travel and drive the vehicle. Locate the parking space - it's legal. We can park there. You signal, shoulder check. Shoulder check again - 6-9 inches (15-20 cm) from the curb. Slow down - as we slow down, we crank the steering wheel all the way to the left and stop. We control the brake and roll back until the steer tire touches the curb. When it touches the curb--right there--we apply the parking brake. Sorry, apply the foot brake, and then apply the parking brake. Into first gear, if you're driving a manual. If you're driving an automatic, into PARK. Turn the vehicle off and you tell the examiner that you're done. If you're going to leave the vehicle, you would lock the vehicle, put away your valuables - take your values with you or cover them up with something in the vehicle. Stow them somewhere where they're going to be safe and not tempt thieves to break into your vehicle. So that's how you do uphill with a curb. And again, uphill with a curb is the only one you put your wheels out. Every other one--uphill & downhill without a curb and downhill with a curb are all with the wheels pointing in towards the shoulder of the road. We're going to leave the parking space - so we leave the parking space - we apply the brake pedal, and start the vehicle. Keep your foot on the brake pedal, and release the parking brake. Into your forward gear or into DRIVE for an automatic. Mirror, signal, shoulder check. And our wheels are already cranked to the left, so we're probably gonna have to bring them back to--a little bit to centre. There's a vehicle coming here. I'm going to wait for that vehicle. And it looks like that vehicle is turning, which it is. Look in the path of travel, and accelerate with my right foot. Parking downhill with a curb. We're going to locate the space. Mirror, signal, shoulder check and we're going to pull in so we're six to nine inches (15-20cm) from the curb. As the vehicle just about centers, crank the steering wheel all the way to the left and then immediately all the way to the right, and control the speed of the vehicle. And just control it until the front tire touches the curb. When the front tire touches the curb, keep the brake applied. Keep your foot on the brake; apply the parking brake. Into first gear. Most of you'll be driving an automatic. Into PARK. Turn the vehicle off. Release the primary controls - the foot pedals. 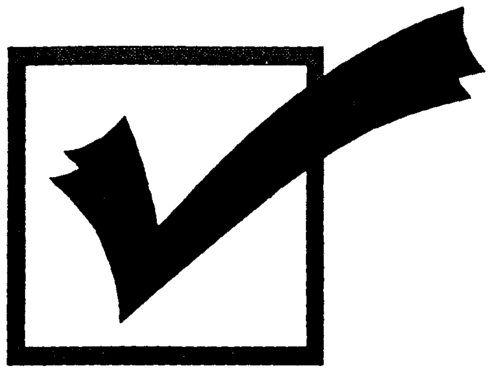 If you're leaving the vehicle, which you you won't be for the purposes of a road test, you get out, you secure the vehicle, lock the doors, and cover up all your valuables and those types of things in the vehicle. We're parked down here with a curb and our wheels are all the way into the right. So we mirror, signal, shoulder check. And we're going to have to wheel the steering wheel all the way back. So mirror, signal, shoulder check. And we turn the steering wheel all the way to the left. And we start and shoulder check again. And we look into our path of travel and accelerate. Parking down hill with a curb. Into the curb - 6 to 9 inches (15-20cm) from the curb - just as we come to a stop, we cranked all the way to the left and then in to the right until the front tire touches the curb. Hold the brake pedal, apply the parking brake, into a forward gear or into PARK if you're driving an automatic. Shut the vehicle off and release the controls. To leave, start the vehicle. Put your foot on the brake pedal, release the parking brake. Mirror, signal, shoulder check. Nobody coming. And remember your wheels are cranked all the way to the right. So you got to start bringing - just let the vehicle move a little bit and as it starts to move, then crank the wheel all the way - not all the way to the left, but to the left. So one-and-a-half turns and then another probably half a turn to get it to move to the left. And start to accelerate, and look in the path of travel. Where we want to go. We have to cross over the center line here because there's a car parked there. Parking uphill without a curb. Locate the space - mirror, signal, shoulder check - into the space. Slowing down and just as we come to a stop crank the wheels all the way to the left. Put the vehicle into a forward gear - into park if you're driving an automatic, which most of you will be. Parking brake on - hold the brake pedal. Shut the vehicle off and secure the vehicle. And you can leave - tell the examiner that you're done at this point. And the reason that the wheels are in without a curb is because if in the unlikely event that the brakes let go-- because the front wheels are in--the vehicle is going to go like this, and it's going to roll off the roadway, as opposed to out into traffic. And that's why the wheels are always in without a curb because the vehicle is going to roll off the roadway, and not out into traffic. And that's essentially the reason for the wheel positions is to prevent the vehicle from rolling out into traffic in the unlikely event that the brakes release. So that's how you do it uphill without a curb. Now we'll go find another space and will show you how to do it downhill without a curb. To leave the space. Put your foot on the brake pedal. Start the vehicle - keep your foot on the brake pedal. Release the parking brake. Into your forward gear - those you driving an automatic - into the DRIVE which will be most of you. Look-- mirror, signal, shoulder check. I got my signal on - nobody coming. And remember, your wheels are all the way to the right, so you need to steer one-and-a-half turns and then a little bit more back to left to get it out into the lane of traffic. So mirror, signal, shoulder check, and steering. And we go, looking up and accelerating. Downhill without a curb- the space is legal. Mirror, signal, shoulder check. Off the road into the space. Nice and slow. And all the way to the right. Into PARK. Keep your foot on the brake pedal. Apply the parking brake. Shut the vehicle off and you tell the examiner that you're finished. If you're going to leave the vehicle you would lock the doors and secure any valuables. That's how you do it downhill without a curb. Preparing to leave - put your foot on the brake pedal, start the engine. Release the parking brake, and keep your foot on the brake pedal. Into first gear or into DRIVE for those of you driving an automatic, which will be most of you will be. We signal, shoulder check to the left, and remember you got your wheels all the way to the right. So you have to steer one-and-a-half and then a little bit to get the steering wheel back into traffic. You signal, shoulder check, roll the vehicle and steer. You begin to accelerate back onto the roadway, and look in the path of travel and accelerate with your right foot. And your signal doesn't cancel, you'll have to cancel your signal. Quick review of hill parking. There are four parks - remember the three-&-one rule. Three of the parks are in towards the shoulder of the road. So turn your steer tires all the way to the right: uphill & downhill without a curb are in towards the shoulder of the road so the vehicle rolls off the road and not out into traffic in the event that the brakes release. Downhill with a curb, as well, in towards the shoulder of the road, but just as you get into the space and the vehicle begins to straighten out, you crank your wheels all the way to the left quickly and then immediately turn your wheels all the way back to the right. Control the vehicle and allow the front steer tire to rest against the curb. That way, if the brakes release it's not going to move. The same thing uphill with a curb: you move into the space, crank your tires all the way to the left and put the vehicle in neutral, and allow it to roll backwards until the front steer tire rests against the curb. Again it's secured against movement. Now one note that I will say as you can see here in the image, there's a little half rolling curb. Those little half curbs will not hold the vehicle if the brakes release. 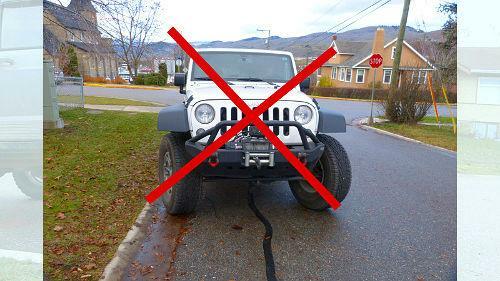 So treat that as if it is not a curb and put your steer tires in towards the shoulder of the road. That way if the brakes release, it's not going to roll out into traffic - as this Jeep probably will if the brakes release. As you can see here behind me, there's four vehicles parked behind me: one of the vehicles made kind of a half attempt to get the wheels all the way out to the left; another vehicle did, but none of them rested the steer tire back against the curb. So most people--in what I call "social driving"-- after they get their license do not park correctly on the hill for the purposes of a road test. And again I'll just reiterate that this is not just for passenger vehicles - this is also for commercial drivers getting a commercial license. Some of the test centers will require you to be able to hill park in a commercial vehicle. Do you have hills where you have to park and do your hill park correctly? Leave a comment down in the comment section there, all that helps us out. I'm Rick with Smart Drive Test, thanks very much for watching. If you like what you see here share, subscribe, leave a comment down in the comment section. As well, hit that thumbs up button. Check out all the videos here on the channel. Lots of great information if you're working towards a license or starting a career as a truck or bus driver. As well, head over to my website - lots of great information over there. As well as online courses. Thanks again for watching. Good luck on your road test. And remember, pick the best answer not necessarily the right answer. Have a great day. Bye now!